1. Internal capability: Smaller businesses don’t have internal experts who truly understand the analytics required for the solution they need, let alone people who can build an application designed for that particular purpose. Small best-in-class products are a good option here, but they may not deliver an answer specific enough to meet the needs of the business or scale well over time. 2. Cost: Building and maintaining a tool in-house invariably carries hidden costs for businesses that aren’t experienced in building software, and total cost of ownership can be much greater than expected. 3. Time: Large organisations with long term vision and big budgets will be able to afford enterprise tools. But it’s imperative to take into consideration the time and people resources needed to purchase the tool, implement it, integrate it, test it and get it functioning the way you need it to. 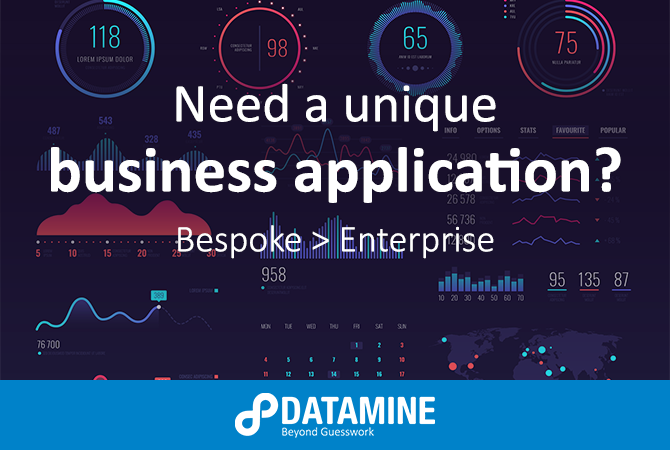 The solution many have turned to recently is the creation of bespoke analytical applications that are designed to address their unique business needs. These bespoke solutions can be created to achieve a range of business purposes across virtually all industries, whether the objective is to track orders, log data, visualise statistics, optimise operations, forecast sales or more. Why are bespoke analytical applications so useful? We recently worked with the Real Estate Institute of New Zealand (REINZ) to help them create a bespoke web platform designed to deliver proprietary data to their members. REINZ has an immense amount of proprietary data that it can offer its members – insights into market trends, sales information, location comparisons, market analyses and more. However, their platform for delivering this information online needed to be upgraded in order to offer customers the value that they require out of their membership. The team at REINZ realised that they needed a flexible platform that allowed them to configure data-driven insights, reports and products in a streamlined, scalable way. They ultimately chose Datamine as their analytics partner because we have analysts, developers and commercial experts all in one team, which gives us the internal capability to build databases, configure and connect APIs, display and visualise data, do analytics and more. We took an agile and flexible approach to the build that was based on small sprints with a focus on minimum viable product, and then built out from there. The end result was a new web-based business application that optimises the retrieval of relevant data from multiple sources and displays it in an engaging and informative way. The goal of this new platform (entirely cloud-based and hosted in Azure) is for members to be able to interact with data, create reports and glean insights. In addition to collating all of the existing REINZ data into one user-friendly interface, Datamine also added census data and Ministry of Business, Innovation and Employment (MBIE) rental data to give members an even more comprehensive view into current real estate market trends. Reinforcing the value of REINZ’s representation, the new platform has been positively received by both the REINZ team and the company’s stakeholders. It has quickly become one of the most used digital assets at REINZ, with members praising both its engaging interface and incredible value. The benefits of this application will extend beyond the present day – as their database grows and membership increases, the application can be scaled very quickly at low incremental costs, meaning the platform will continue to work for REINZ far into the future. For the past few years, Datamine has partnered with QMS (an outdoor media company) to create an analytical application that optimises billboard placement using aggregated mobile location data. QMS is an organisation that manages outdoor media displays throughout New Zealand and Australia. In order to sell advertisement slots on billboards, digital billboards and buses, they need to provide the client with a sense for what kind of person might be seeing the ads, at what time, in what location etc. They realised that they needed a data-driven way to do this, so they got in touch with Datamine about creating an analytical solution that would deliver the measurement and insights needed. Our team of product managers, data scientists and UX developers worked with QMS to produce an application called The Datalab. It uses external data, such as aggregated Census, banking and mobile location information, to show QMS clients what the potential reach of their media campaign would be. The application effectively manages access rights and a number of different permission levels, dictating not only what can be seen, but also the scenarios and calculations that can be run. The platform is an ongoing partnership, and The Datalab is at the heart of every campaign recommendation QMS delivers to its customers. They’ve been thrilled with the results of the platform, as have their clients – in the words of one customer, “QMS’ reach and frequency measurement tools enable us to effectively optimise our out-of-home advertising campaigns by assessing various scenarios to ensure we deliver to our clients objectives.” Since QMS began working with Datamine, turnover has doubled. In another recent project, Datamine created a unique business forecasting solution for a large international retailer. Datamine was approached by a large retailer that wanted a more advanced forecasting solution. The company had thousands of stores, each of which had its own way of deciding what products to stock on any given day. This led to a lack of central visibility, difficulty optimising the range and wastage that was 3x the industry average. The organisation found that these challenges led to disappointing customer experiences, as well as inconsistencies that made it difficult to implement sustained improvements across the brand. Datamine created a forecasting application that allowed the retailer to understand the likely demand for the products at each individual store, depending on the time of day and the day of the week. This solution allowed the client to overlay business rules and constraints, creating an optimal recommendation of products to stock on an ongoing basis. As an additional bonus, the forecasting application also consolidated supplier activities and minimised the disruption of stockouts. In the first 12 months after implementing the forecasting solution, the retailer achieved an increase in sales of over 8% and an overall waste reduction of around 17%. The recommendations from the application successfully determined which were the right products to stock in a given time and place to best serve customer needs. Another beneficial outcome of the solution was the improved ability to onboard new products and get them in the right places more quickly. If you're interested in pursuing your own bespoke analytical application, we’re keen to hear about it - get in touch with us below.